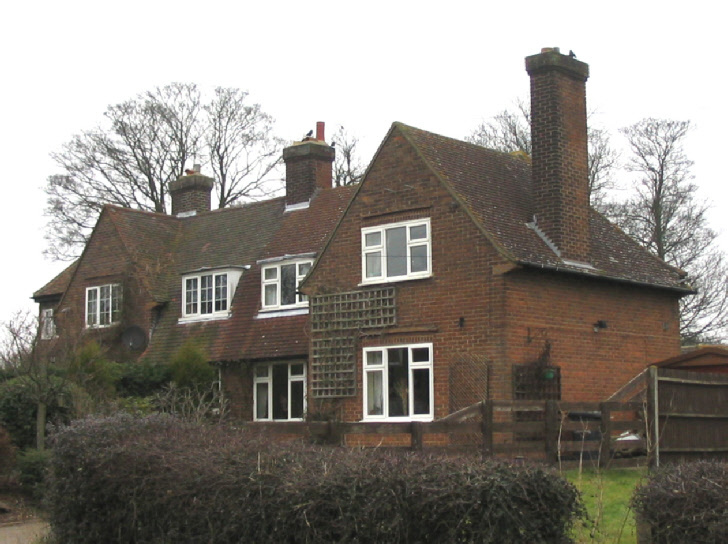 The buildings on the north-east side of Chequers Lane were in the parish of Ippollitts. As a comparison of the maps from 1816 (left) and 1898 shows below, they were virtually unchanged during the nineteenth century. 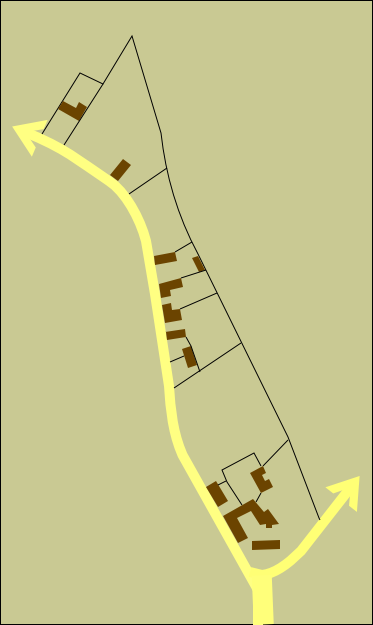 Chequers Inn, ‘Sadleirs End’ and the property immediately to the north-west were part of the Temple Dinsley estate. 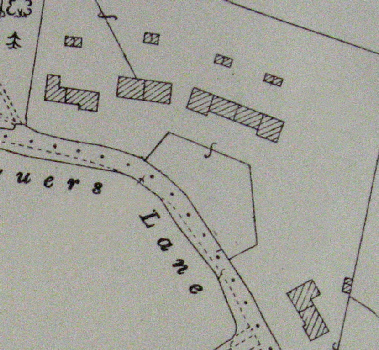 In the nineteenth century there were no houses on the south-west side of Chequers Lane. the Lane towards the junction with the Hitchin Road with the north-east side of the lane on the left as viewed. 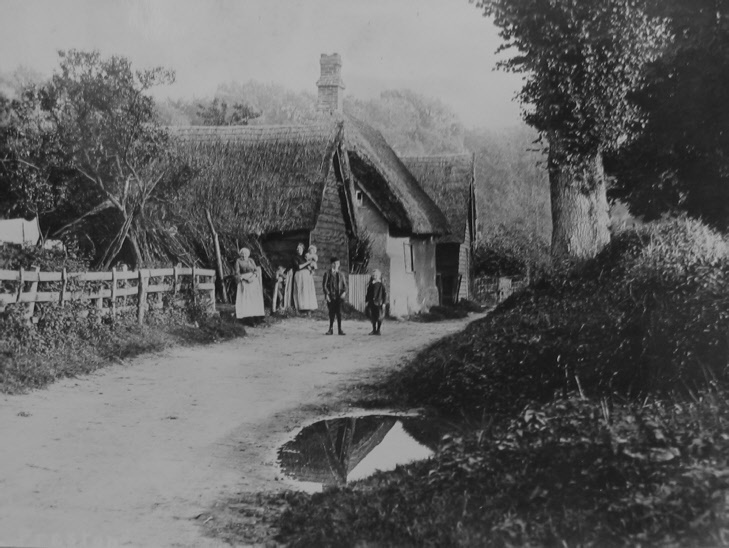 The barn in the foreground and the thatched house must be shown as A on the map above, right. by A Ayres (erased), now Sharp. Owned by E Curling. By E Jenkins (previously, vacant). Owned by E Curling. by A Wray (erased), now Thrussell. Owned by E Curling. by W Ewington (erased), now A Simons. Owned by E Curling. thatched barn, stable, cart shed and garden. Occupied by J Jeeves. Owned by R de V Pryor. Sadleirs End House and shop - brick and tiles. Sitting room, kitchen, scullery and pantry. Three bedrooms. Wood and corrugated iron stable. Occupied by T Thrussell. Owned by R de V Pryor. 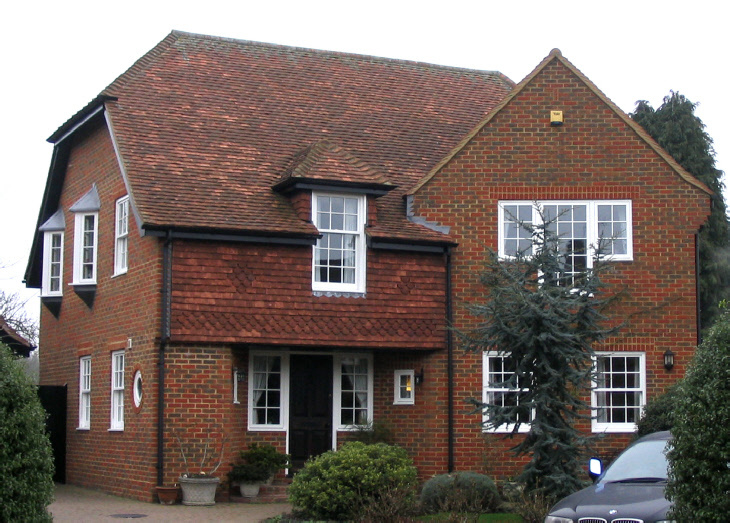 Chequers Inn Brick and tiled house. Cellar, bar, club room, tap room, sitting room, kitchen and scullery. brick and slated store. In fair repair. 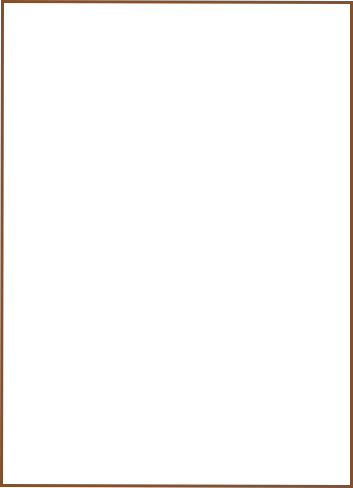 Occupied by J Scott (erased) now Brown. Owned by R de V Pryor. Innkeeper of ‘The Chequers Inn’. Note: One of these families was probably living in ‘Spindle Cottage on the Hitchin Road. Note: The enumerator probably followed the same route in 1841 and 1851 starting at the northern-most end of the lane. JEEVES, William. Publican. Chequers Inn. 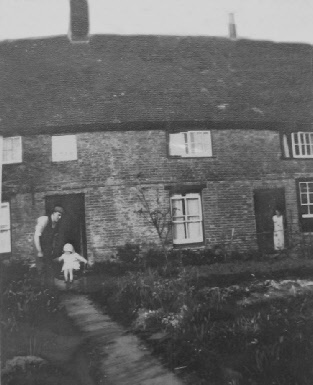 It is clear that, with the exception of Chequers Inn and ‘Sadleirs End’, the old, tumbledown cottages on the north-east side of Chequers Lane were destined to be demolished. 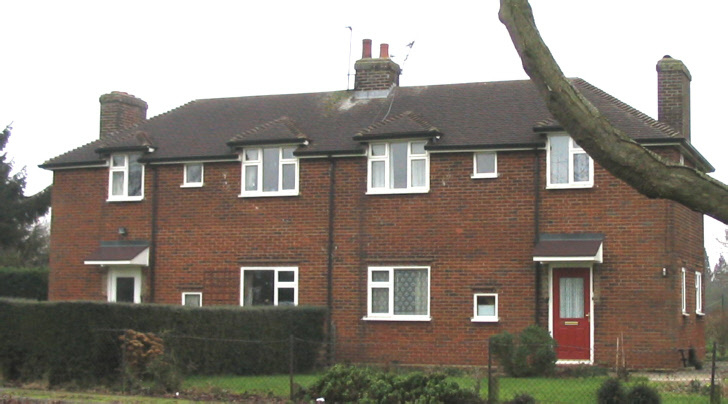 As there were probably only four homes inhabited here in 1920 (see below), probably the process of pulling them down and building new houses had started by then. Many, if not all were council houses and the Preston School records indicate that some had been completed and let by July 1922. 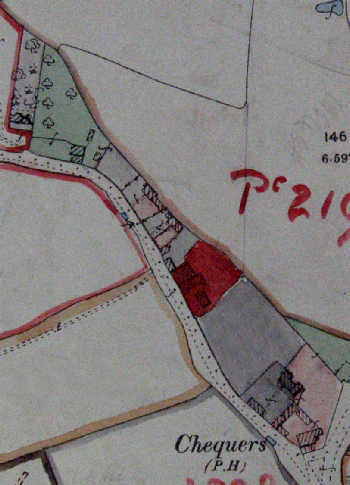 By the early 1920s, ten new council houses had been built along this side of Chequers Lane (see map below) and two more were added later (Nos 9 and 10). THRUSSELL, Thomas and Charlotte, ‘Sadleirs End’ ? FREEMAN, Reuben George and Bessie with Elizabeth and Eva Tristram 10 ? 1 1951 MARDELL, Francis and Leslie 1971 WOODHAMS, Brian, Gillian and Rachel. 12 1951 CRAWLEY, George and Lilian 1966 PALMER, Reuben and Maureen 1995 MARTIN, Geoffrey & Arline. 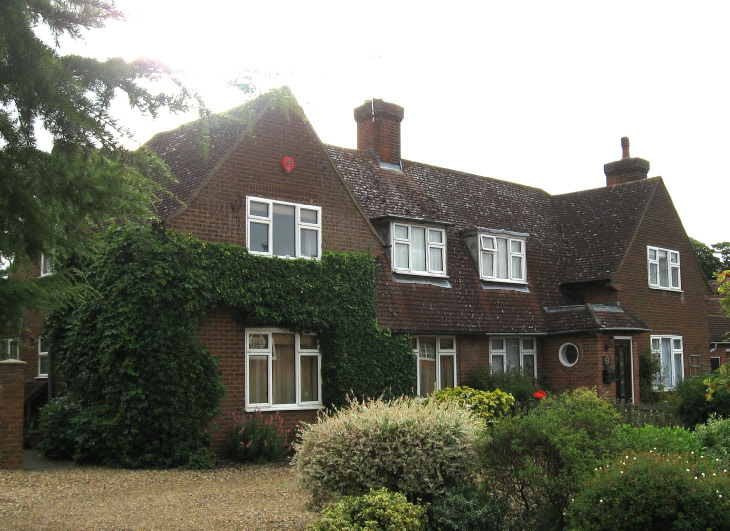 Chequers End has a Reception Hall, Cloakroom, Drawing Room, Dining Room, Study, Kitchen/Breakfast Room, Utility Room, 5 Bedrooms and a Playroom/Bedroom. ‘Wickets’ was built in the late 1990s. 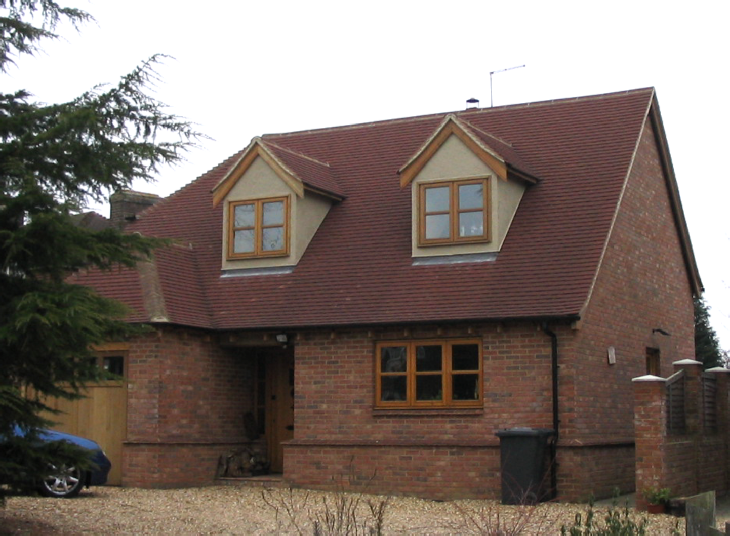 Its first occupants were BROUGHTON, Nicholas and Annita. 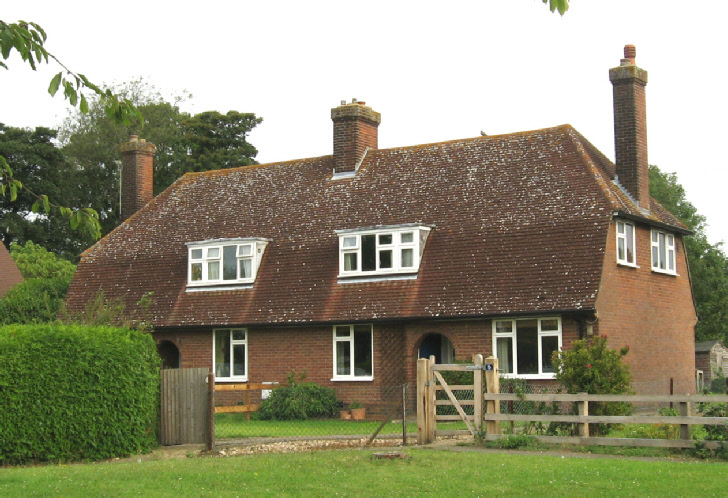 ‘Boundary House’ was built in around 2000. Its first occupant was Tony RAFFE. 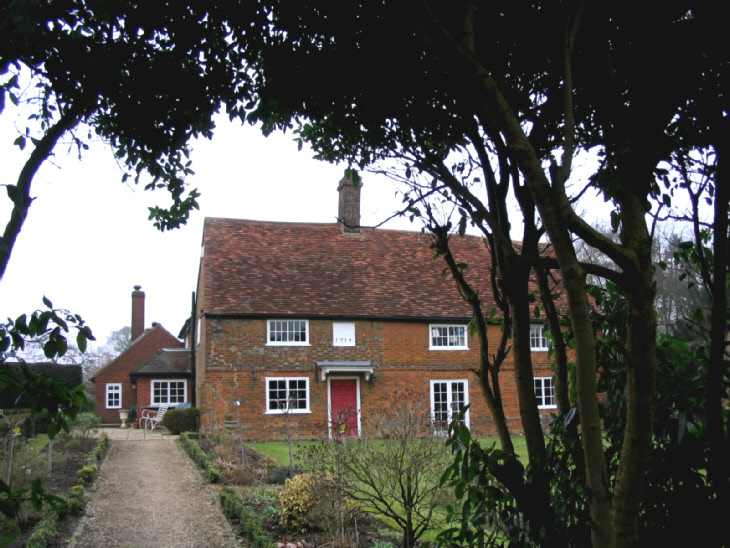 ‘Sadleirs End’ was built in the early sixteenth century and a chimney and floor were inserted in the seventeenth century. 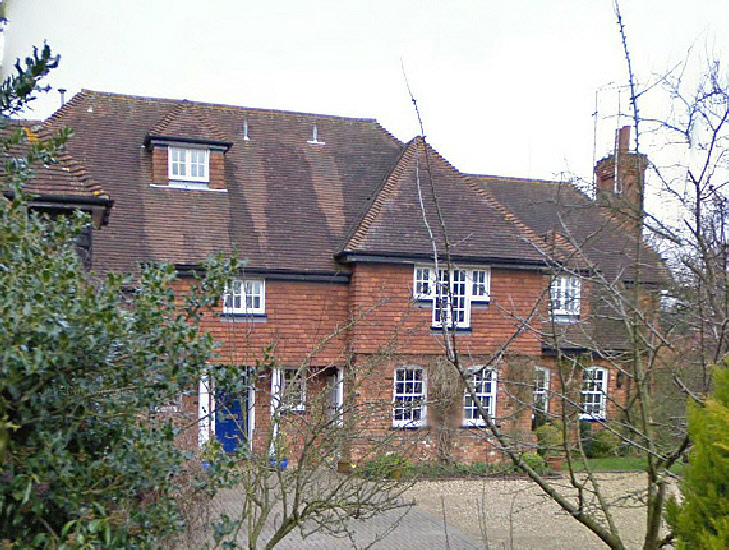 An extension to the rear was added in the 1970s. 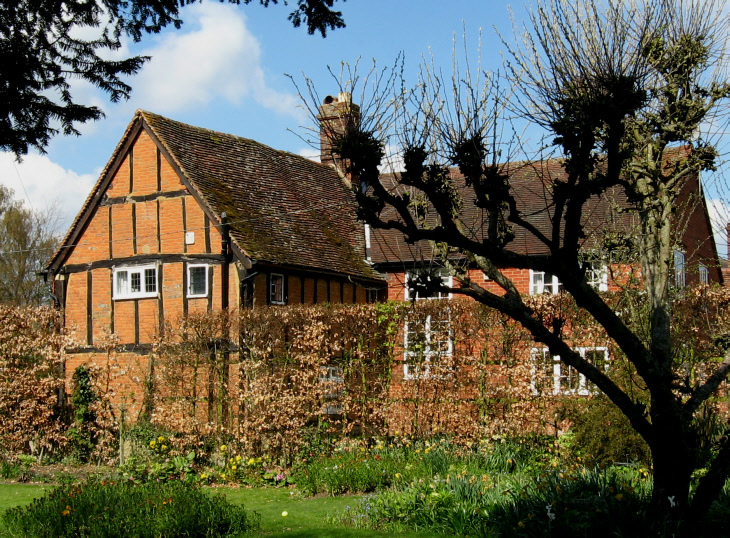 In 1910, it was described as a brick and tiled house with a sitting room, kitchen, scullery, pantry and three bedrooms. On its land was a wood and corrugated iron stable. By 1873, ‘Sadleirs End’ was part of the Temple Dinsley Estate. 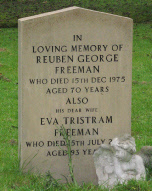 Reuben was buried at St Martins, Preston on 10 April 1976. J. M. Dent in London. 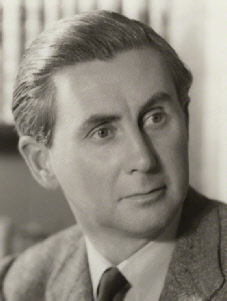 During World War II as Book Officer for the British Council he formed a unit translating books into Arabic. On returning to civilian life, he founded The Cupid Press, based at ‘Sadleirs End’, which specialised in limited edition anthologies of poetry. 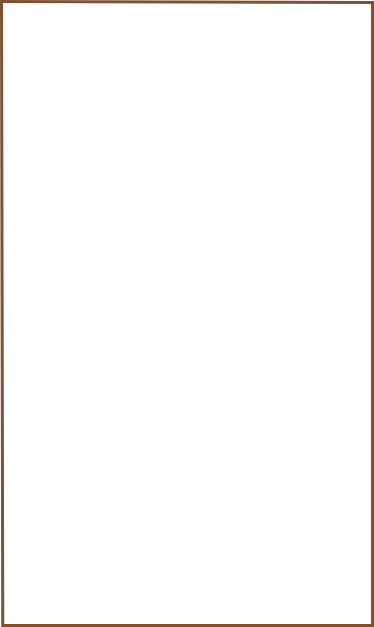 Such as ‘Restoration Love Songs’ (1950).